You know how I love the 1930s. And I've spent many an evening perusing 1st dibs for pieces by Jean-Michel Frank, Serge Roche, et al. So I was excited to learn about a new furniture line from Currey & Company. Created by Will Merrill, the "Echoes" collection pays homage to the Modernist greats like Frank, Roche, and Giacometti. According to Merrill, "These pieces of 'Modern' furniture were mixing with, and looking very much at home with the Louis XV and Louis XVI Bergeres and Commodes... The designs of these mid 20th Century pieces were obviously being recognized by the dealers as the 'new Antiques'. And their prices confirmed this, escalating to meet the prices of the 18th Century antiques!" Doesn't Merrill have a point! I think what is great about this collection is that it not only captures the spirit of this legendary period in design, but it does so at a more affordable price. 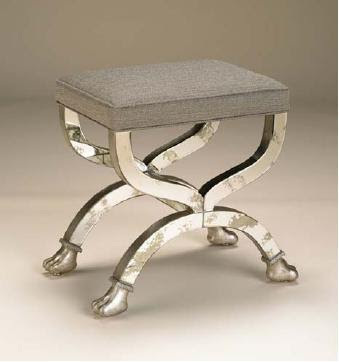 These nesting tables are reminiscent of those designed by Jean-Michel Frank. In order to create a parchment-like look (remember, Frank used parchment often), craftsmen have antiqued and lacquered abaca paper, giving the tables an aged patina. Love these! We all know the inspiration behind this bench! It's the classic Serge Roche mirrored bench, used by Elsie de Wolfe in various installations. 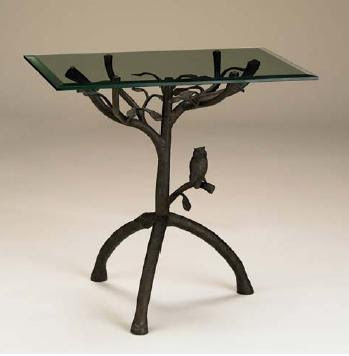 This hand-wrought iron table is based on a similar design from Diego Giacometti. Again, another Roche-esque design. 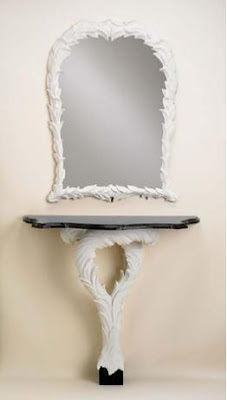 Both the mirror and the pedestal are gesso-finished. Image at top: Syrie Maugham was an enthusiastic fan of plaster palms. Curiously, I was talking with a dealer not long ago who informed me that real 18th-century pieces are practically a steal now, given the white-hot market for 20th-century designs. Even Jansen's repros of 18th-century pieces are going to 10x as much as the real thing. And a major stylesetter I know has been snapping up Louis XV and Louis XVI originals because prices have dropped so much. Crazy, huh? Aesthete- Crazy indeed! I remember thinking a few years back that the prices of the 20th c. pieces seemed outlandish- but now those prices seem like a bargain compared to what they're commanding today. I think all these pieces are successful, except those in last shot, both of which look undernourished. They need bulked up. I say that as a major Serge Roche fan. I grew up in Danville, Illinois and up until about ten years ago, there was a women's dress shop whose swoony decor had come lock, stock & barrel--and those would be metaphorical barrels, of course--from Paris in 1937. A local woman had gone to the Exposition & come home with not only a boatload of new dresses but a full interior for her new shop. The Parisian was the most elegant store in town, and probably, in the whole state outside of Chicago. The walls were Wedgwood blue, the feather-sculpted carpet was pearl gray, the semicircilar Syrie Maugham banquettes were deep rose with fringe a foot long & thick as a rope. There were plaster side tables balancing on glass balls, Serge Roche palm-trunk consoles & gigantic three-way mirrors set into palm-edged niches in the wall. All the lamps were big, chunky cryustal, and there was a white French phone on a mile long cord--the only one I ever saw outside a movie--that would be brought out for customers who received calls while shopping, which most of said customers managed to arrange ahead of time, because in Danville, being spotted talking on the French phone in the front window of The Parisian, while local girls in the latest fashions paraded in front of you was as good as it ever got. Hovering above all this drama down below was a Modern baroque ceiling in sculptured plaster, with rose-pink cove lighting. Under that light, every woman looked good. I was only 5 or 6 when I first saw the place on a trip downtown with my grandmother, and while she tried on clothes & exchanged town gossip with the owner, I checked the place out. I had no idea what I was looking at--or, for that matter, how rare something like this was, especially plunked down in the middle of the cornbelt: like I said, I was 6---but I knew, even then, that it was absolutely unlike anything else in town. The miracle is that it survived as long as it did, but the tragedy is that one day in the 1990s, I went down to see my grandmother, and as we drove past, I saw that The Parisan was closed, its interior gutted. 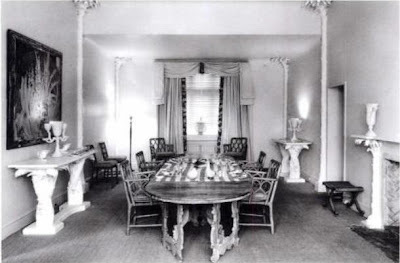 The feather-pattern carpet was still there, and the ceiling, and the center panel of the big wall-mirrors, but the white plaster palms were gone, and so was all the furniture. I asked around, hoping that it was all in storage, or that it had been disassembled and sent to an art gallery in Chicago, or something but no one seemed to know anything, or to care. To me the stuff might have been museum-worthy, but to the locals, it was all just stuff out of a dingy old store that went out of business when the people who owned it died. No big deal. Still, I keep hoping that someday, I'll find the whole ensemble, covered with dust but otherwise intact, in the back room of a local antique mall. Love love love! Beautiful, and really interesting post, and comments :-) Looking forward to the post on Jean-Michel Frank already ! How exciting... can't wait to see his line in person. 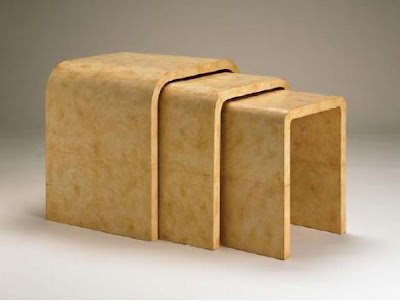 The furniture of the 1930s is so lovely and artistic. Merrill's finishes and takes on these classics look quite amazing. Thanks for letting us know about his new line. I'm glad you all like the line. I'm anxious to see the finish on those parchment tables. The whole process sounds amazing. May I suggest "Serge Roche" by Patrick Mauries? I picked up my copy at the Cooper-Hewitt. By the way, I loved reading the comment by Magnaverde. S.- So glad you did suggest it. I'm not familiar with that book, but I'm off to add it to my wishlist! As you know I'm a huge fan of that era too, so thanks for sharing this new collection. My copy of the new JM Frank book is on its way, so I can't wait to digest it! Nice post! I'm interesting in seeing the finished product! Would love to see that Parisian shop that Magnaverdes talked about. It must have been amazing! I recently did a post on the Serge Roche book. You can see photos on my blog! This is good news! Mrs. E. and I couldn't touch the pieces we found in London. It would be nice to have an option with no exchange rate. Off to see the website. Thanks! I love the black iron botanical table! So endlessly chic yet quirky at the same time. I'm definitely crushing... check out my blog at www.urbanfleadesign.com!